The World Cup is already on its way, with Brazil winning over Croatia 3:1 in the first game, and we already made a thorough list of apps for following the tournament or streaming it live on your Android, iOS or Windows Phone devices. If you are already there, however, in the heart of the Brazil action, and in Rio de Janeiro in particular, a new travel guide app might be better suited for fully experiencing the city. 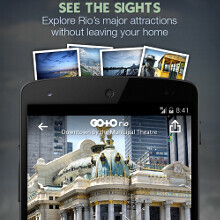 Rio de Janeiro Guide: GoTo Rio has it all - high-res pictures of sightseeing places and maps of the city and its transportation system that don't require an Internet connection to load, interesting trivia about the places you are likely to visit, the works. There are even videos there, and tips for exploring the city from a guy or a girl perspective. You can also book a hotel or a ticket for the most popular attractions through the app, and the kicker is that the Rio content is entirely original, unlike most travel apps, where the descriptions are simply cut and paste from Wikipedia. The icing on the cake is the beautiful, easy to navigate interface, so if you are heading to Brasil now, or are already in Rio de Janeiro, give GoTo Rio a chance. Ok ! Where´s the pictures showing 100,000 people joined a mainly peaceful march against world cup ??? No world cup ! I get it, in addition to the US, you cover other countries. When is the cup over? Soon I hope. Where's the official "GoTo Hell" guide for using Google's new app permissions system?